Youth, innocence, a name and life. These are four words that can describe a young lady who attracted a man’s attention with one swift glance. The great Henry VIII met his fourth wife Anne of Cleves and it was obvious from the very beginning that this marriage wasn’t going to last for very long. Catherine’s birthday is unknown, and her father was the youngest brother of the Duke of Norfolk. Her parents died , while she was very young. She was sent to live with her grandmother the Dowager Duchess who watched over houses at Chesworth House. This is where she would run around with other children who had lost their parents, and because of this she was not as educated as any of the wives Henry had, had before her. She was known for her beauty, and being vivacious. 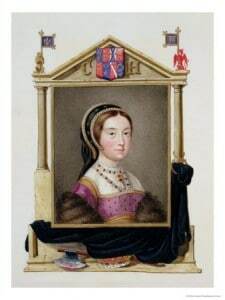 Catherine was cousin to Henry’s second wife, Anne Boleyn, through Anne’s mother’s side. Like her cousin, she fell in love young and was once engaged to Francis Dereham, in 1538. Here they would start calling each other “Husband” and “Wife”. There she would also do the wifely duties for him, including cooking, laundry, and even holding his money. They were known to have a precontracted marriage, if this was true, in the eyes of the Church, even if they had not had sexual actions they were married. In 1539, The Dowager Duchess caught onto the love affair and ended the relationship. With her name of Howard, it was easy to get her a position as one of the laidies in waiting for Anne of Cleves. During Henry and Anne of Cleves short marriage, Henry saw Catherine and as quickly as he divorced Anne, he was married to Catherine. Within the beginning of her marriage Henry lavished upon her and her family land, gold, and fabrics. Another like to her great cousin, Anne Boleyn, Catherine began to have a giant influence on the king. He was quickly happy, and people of the court often said, “The King’s affection was so marvelously set upon that gentlewoman, as it was never known that he had to like to any woman”. At this time Henry was now weighing in at three hundred pounds and suffered many illnesses due to his injured leg, which was the cause of his weight gain. He was reaching the age of fifty. Around the year of 1541 Catherine fell for one of Henry’s male courtiers, Thomas Culpeper. Catherine had considered marrying him during her time as a maid-of-honor to Anne of Cleves. According to Francis Dereham’s testimony Thomas Culpeper “had succeeded in the Queen’s affections,” this was quickly becoming known while summer came around and they went onto progress together, people who knew of this would come up to her and offer her their silence in return for riches. Lady Rochford, the late wife of George Boleyn, Anne Boleyn’s executed brother, would arrange secret meetings between Catherine and Thomas. On November 1, 1542 Thomas Crammer, Archbishop of Canterbury, gave Henry a list of accusations, and the fact that she was already married, and by November 23rd, Catherine was stripped of her title as Queen of England and imprisoned in Syon Abbey, Middlesex all through the winter of 1541. Francis and Thomas were both executed on December 10th, 1541. According to those on the streets of England their heads were placed atop London Bridge. Many of her family member s were put in prison and found guilty of treason. Catherine remained imprisoned until Parliament made the Bill of Attainder on February 7th, 1542, this meant it was treason and punishable by death for a Queen Consort to fail to tell her sexual history to a King within twenty days of their marriage, or to incite someone to commit adultery with her. This solved her pre-marriage contract matter and made her guilty, he fate was sealed. Catherine’s execution was seven a.m. on the 13th of February. She seemed pale and completely terrified and needed help climbing up the scaffold. During her speech she stated her punishment was “worthy and fit” and said a sentence that would go down in history, “I die a Queen, but I would rather have died the wife of Culpeper”. She executed with only one stroke. She now lays with her cousins George and Anne Boleyn in a chapel of St. Peter ad Vincula. Catherines body was not located in the chapel during its reconstruction, but a plaque remains there in her memory. Catherine is one of my favorite Tudor characters. She was willing to be the proper wife to a husband. She wished to bear children and was young. She was less gifted in the education section but certainly made up for it in ‘street smarts’. She danced often, teaching her ladies to learn new routines. Though scared, she was determined to die with dignity, and in the end after watching her head lady, the Lady Rochford, was executed before her. She requested for the block to be brought up into her room so that she would be prepared. It took a lot of courage for Catharine to admit that she would have rather died being Thomas Culpepers wife this Henry’s. It takes a lot of courage to stand up to a king. I believe she was a martyr.John foxe was alive during that time and has greater research than any of you who claim to have done your “research”,information has been changed or altered since then. Quit wasting your time .thank you. Two questions: for what was she martyred, and how do you know information has been changed or altered? Everything in here has been historically researched. I am a tudor historian in America. Everything I had wrote is the truth. Well actually, one thing in your version isn’t true at all. Catherine H did not say she’d rather die as Culpeppers wife then wife of the king. Believe me, I would much, much rather it were true, and that she really had said that!!! But, the truth is the truth, and from all I’ve read, which is everything I can get my hands on. . .but it all states that this statement is nothing more than romantic myth. John Foxe didn’t always report accurately and much of his so called research is suspect. Kathryn Howard was no martyr. That doesn’t mean she was guilty of anything which deserved death either. There is little concrete evidence that she committed adultery, although meeting with Thomas Culpeper late at night was dangerous and foolish and gave room for suspension. She died with dignity and didn’t declare that she wanted to die the wife of Culpeper. Two eye witness accounts contradict this myth. People on this site whose articles appear here do a lot of research and deserve more respect. Seriously how does anyone know what is true and what isn’t? All accounts are second hand…….Still all societies have rules and the rules of the dayback in Henry’s time regarding being married to a King were very different than today.No doubt there were double standards but the rules were clear. Being the King’s wife brought great privilige but screwing his hired help wasn’t very smart. I can’t see how Howard was a matyr since by definition a matryr is someone who suffers death and persecution for refusing to denounce a belief or cause usually for religious reasons. Commiting adultery is hardly a belief or a cause. I certainly am glad I didn’t live in those times. Women were little more than slaves to breed and keep house.